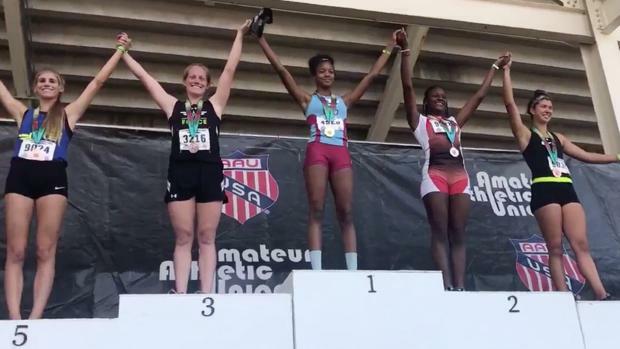 The second day of the AAU Junior Olympic Games was highlighted by the first record of the championship. Check out the top race, interview, and tweet of the day from Ypsilanti, Michigan. Akari Marshall earned the distinction of record-holder when she won the girls triathlon for the 9-year-old division. The track star from Lake Worth, Florida, jumped 1.20m in the high jump, threw 5.25m in the shot put, and ran 28.88 seconds to win her heat of the 200m and sweep the triathlon title. Marshall earned 1,099 points total, which broke the nine-year-old AAU national championship record. It was also the first record to fall at this year's AAU Junior Olympic Games. 1996 Olympic gold medalist Jason Rouser caught up with MileSplit and expressed his excitement for the progression of the youth track scene year over year. While competing, Rouser contributed to Team USA's gold medal-winning 4x400m relay. He also earned world championship gold as part of the 1993 and 1997 4x400m relay teams. He is currently coaching the sprints and relays at the University of Southern Florida. After breaking the nine-year-old AAU national championship record, Marshall expressed her excitement about her performance.